I'm new to this, first experience actually. I acquired the above non-mechanical (not quite Las Vegas) slot device. I believe its Australian since i bought it from an Aussie plus it still had a few Australian penny coins in the inside. 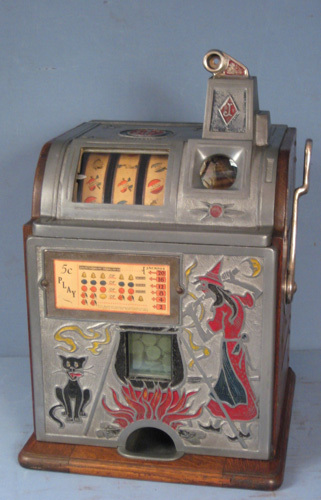 You drop a coin in the top right, it falls to the first level and rolls down to a loosely fitted washer (there is one on each side of all levels). You then hit the exposed part of the washer from the outside of the frame thereby shooting the coin to the other side hopefully avoiding the obstacles and down to the next level. Hitting the obstacles means you lose the coin to the machine. You do this repeatedly until you reach the bottom and WIN. There are no markings or names on the device and i'm interested in any knowledge of this type plus any link to see similar types as i have been unsuccessful in finding it thru Google so far. Thank you for any help you can provide and allow me to complement you on a lovely business to be part of.